Project specific costs are created through development of the following 4 project factors: 1). Area - size of space being created or remodeled. 2). Architectural Complexity: A box is easier to build than a circle - cantilevers, vaulting, etc add interest & cost. 3). HAAS: the substructure, insulation and HVAC systems - impact efficiency, health and comfort of the occupants as well as durability of the structure. 4). Level of Finish: quality of finishes inside and out. 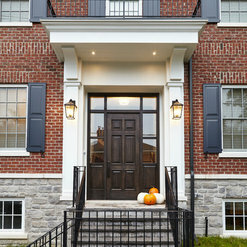 2014 WINNER Best Renovation in Canada (over $500k) - OLYMPIC RENO. I first met Eurodale when I was considering a family room addition, but decided against moving forward with the project. Even then, I was impressed with the service they gave. A few years later, I decided a full custom home was the best option for my family. After reviewing several competing bids, I selected Eurodale for several reasons; - open and honest pricing, including full transparency of their fees - willingness to work closely with my choice of Architect and Interior Designer - detailed knowledge of another quality build they completed the year prior in the neighborhood While my project was somewhat unique, with tight setbacks and difficult grades, the Eurodale team was able to execute the build successfully, ensuring all my budget and scheduling concerns were addressed - with amazing quality. Their entire team was professional from the start, and held true to their commitments. I give Eurodale my highest recommendation, and I would select them again. 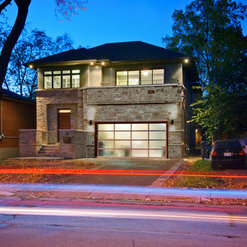 Our familty worked with Eurodale for 18 months to design/build an addition to and renovation of our semi-detached home in North Toronto. Our project entailed a 2-story addition at the rear and the lowering/underpinning of our existing basement. Throughout the entire project, the job site was manned by a lead carpenter and/or second hand who oversaw the numerous sub-trades used. On multiple occasions we received positive feedback from our neighbours regarding the friendliness and courtesy of the lead carpenters and second hands. Having routinely visited the job site during the renovation, we found it consistently kept clean. The site was also well-protected from passersby with extensive hoarding. As part of the project, we dealt directly with Eurodale's sub-contractors regarding kitchens and electrical (i.e. Jimmy from Distinctive by Design and Marco from The Deville Group, respectively) who were a pleasure to work with and had great input into our decision-making process. They were inventive when it came to resolving some unique challenges. Further, we worked with Eurodale's preferred suppliers for bathroom/kitchen fixtures and fittings and tiles (i.e. Daniel at Taps and Jacqui at Ciot). Both Daniel and Jacqui were excellent resources and were helpful in making our selections. Being such a large project, there were countless options available. Eurodale was able to endure our seemingly endless list of questions and permutations to facilitate our decisions. It is evident that the Eurodale team endeavours to provide a quality product to their customers and works with them to ensure their satisfaction. Eurodale - everyone in this industry can learn from this company. Their relentlessness tenacity for approvals, follow up and keeping me informed of every aspect is exceptional. The knowledge and expertise is second to none. Always taking calls, never to busy to connect, leaving me with a sense of pride that i picked the right company for the biggest renovation of my life. I can't say enough amazing things. Their work proves everything i just said. 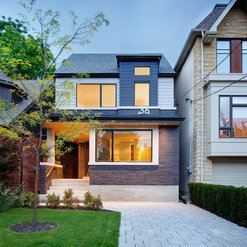 Midtown Toronto – 1942 Bungalow - Gut and Addition of a Second Storey I have just completed a 14 month renovation project with Eurodale Deveolpments and couldn’t be more thrilled with the results. I had never gone through a renovation before, knew nothing about building and didn’t have an architect or an interior designer. I had been thinking about this project for several years and had done a fair amount of research. I had talked to everyone I knew who had gone through a renovation or built a house and had heard every horror story imaginable so I knew I had to be extra careful in the selection process. I had to find a design/build firm that wouldn’t take advantage of a renovation neophyte, a builder whom I could trust and that was experienced enough to guide me through every aspect of the process. I had a number of references from friends and family but luckily I found Eurodale right on my street as they were working on a project for my neighbors. The work site was always impeccable and when I was invited in to see the house with a friend who just happened to be an architect, she commented on the high quality of workmanship. I talked in depth to a number of other builders but ultimately came back to Eurodale. Every one of their clients whom I spoke to said they would absolutely hire them again and I was impressed by their word-of-mouth reputation. To add another layer of complexity I wanted my house to be as “green” as I could possibly afford: solar panels, metal roof, natural insulation, sustainably sourced materials and energy efficient. I knew this would make the process more difficult than normal but. Eurodale was able to guide me to the right suppliers and resources to meet those requirements even if it wasn’t always the easiest route. Jim and Brendan guided me every step of the way through the design and construction processes providing weekly status reports on what had been accomplished, what was on the agenda for the upcoming week and client decisions/actions required. They were professional, organized, resourceful and committed. When problems arose which invariably they did, they would tell me not to stress that they would figure it out and that that’s what I’d hired them for. They were excellent problem solvers and although not the least expensive game in town they were cost-conscious and actively looked for ways to reduce expenditures as well as find the best systems for my house. They advised me on where I should invest and where I could scale back. They were tireless in their efforts to build a house I would be happy with. Most importantly they never let me down and were always there when I needed them - they genuinely care about their client. Clement, the production manager, was incredibly resourceful and endlessly patient as he guided me through window and door selections, plumbing and electrical plans, and a myriad of other decisions that left my head spinning. His attention to details that I likely would have overlooked was phenomenal. He sent photos and drawings whenever I had trouble envisioning something which was frequent. He also reminded me of approaching deadlines and kept a running cost allocation report. Blair and Dillon, the lead and assistant carpenters, were on site every day and looked after the house as if it was their own. I realized during the process that I was a bit spatially challenged and they went out of their way to demonstrate exactly how something would look. Nothing was too much trouble even when it meant it had to be redone because I didn’t quite get it the first time around or it wasn’t really their job. When the wrong portico corbels arrived from the supplier, Blair made the ones I wanted himself. They were perfectionists in everything they did and it is reflected throughout the entire house. Jim and Brendan have a passion for what they do, strong integrity and an extraordinary work ethic which permeates the entire Eurodale team and the trades they work with. They take great pride in their work which is increasingly rare these days and it shows in the end result. Every friend, visitor or trade who has walked through the finished house has commented on the high quality of workmanship and attention to detail. I would not hesitate to hire them again or to recommend Eurodale to anyone who wants to build or renovate their home. Trish, thank you for the kind words and for the recommendation to others to use our services. We do not take the trust and confidence people place in us to undertake a large project to their home, such as the one we did for you, lightly. We are as thrilled as you are with the end results and hope you enjoy the space for years to come. Our whole team is appreciative of the business and compliments of their work. We enjoyed our experience with Eurodale so much the first time (Forest Hill Ravine Rejig - 2015) that we came back to them in 2017 when we wanted to reimagine our backyard. Once again, the team did an outstanding job in bringing our vision to life. See pictures below. What sets Eurodale apart is the process (our lead carpenter Chris was truly an artist), the people (the Brendan and Jim combo just plain works), and the quality (we’ve used others and can say their work stands the test of time and the team fully stands behind it). You can absolutely find less expensive options out there, but with Eurodale you truly get what you pay for. They will absolutely be invited back when we mobilize on stage 3! Our 100 year old, forever home was in good hands during this 10 month gut/reno project planned and executed by the Eurodale team. Professional and on time with quality workmanship by all subcontractors on the jobsite. Proactive problem solving and meticulous attention to details including safety, neighbourly relations, and communication. The team treated the project as though they would live in it themselves. A good news home reno story - they do exist. Lead Carpenter Model makes all the difference. Thank you. Fantastic quality, and great design choices and recommendations. Would have been 5 stars, but had a few frustrating interactions with one of the subcontractors. Overall problems were minor, save for one material oversight that resulted in a bit of a shortcoming from our original plans. Besides that, the core Eurodale team was awesome to work with, and were extremely clean, professional, and thorough. Update for 2019: We were quite happy with Eurodale and their crew, so we selected them again to complete our bathroom renovations. Again, their crew was professional, timely, and did fantastic work. Well worth the price! 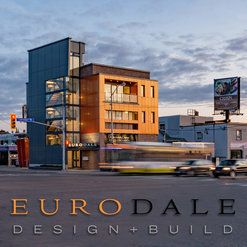 Eurodale Developments has some of the most skilled and professional people in the business! They have been sending their clients to us to select and purchase their kitchen and bathroom plumbing products and we have had such great experiences working with them. We would definitely recommend Eurodale to anyone building or renovating that is looking for a great team, quality work and the utmost professionalism. Eurodale is awesome! 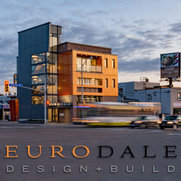 After mulling over the project for several years, we decided to go with the Eurodale team and are so happy we did. 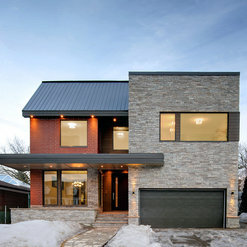 Our project was a rear & side extension on our 2-storey home, including underpinning the existing basement, and a gut job of the old house including a new kitchen, 3 new bathrooms and a deck. From the permitting and approvals processes to the final touches on our home, everyone on the Eurodale team was professional, intelligent, responsive and great to work with. How many people can say they actually enjoyed dealing with their contractors? We can. We had a lot of laughs and we really valued the team's input on many aspects of the design. Their work is of the highest quality and they treated our home like it was theirs. Brendan and Jim have built a remarkable company and we highly recommend Eurodale. Special shout out to Mitch and Dillon for their talent and dedication. 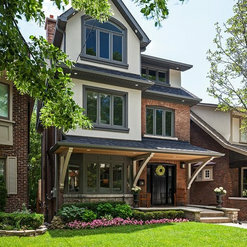 We had Eurodale complete a full Excavation/addition/renovation to our home in the midtown/davisville area that started spring 2015-2016. No project comes without stress, but we can't say enough about this team. They give contractors an amazing name in an industry full of firms that scare many away from renovations and construction. In full disclosure, as happens when trying to keep parts of a 90 year old home some unforeseen things came up. Additional expenses arose. Many of which Brendan did warn us in advance of. Some just bad luck for us (additional concealed asbestos, undermined floor joists etc. Eurodale worked with us and communicated through every stage. No homeowner ever wants to hear about extras but it is a realistic part of the process in Toronto (unfortunately). Every time Brendan and Jim were put up against it with the opportunity to show both their, and their companies character they showed what this firm is all about. Stand up, honest business owners who give you an A++ product. Brendan will tell you right off the bat... You get what you pay for. We sure did. When I think about what might have been, if I took cheaper estimates we had been presented with.. I actually shudder. We ended up experiencing an absolute neighbour from hell situation (refusing access to his property midway through the project too finish siding, which required right of entry permitted access, calling in an encroachment complaint known to be false, sending threatening legal letters to my pregnant wife... The list really goes on and on. Many man hours were spent on Eurodales part for which I never saw a bill). Any other contractor in their right mind would have walked off the job in the first month but the team at Eurodale handled everything with the utmost class. In addition to the amazing ownership team the icing on the cake has to be our lead carpenter Blair. It wasn't until well into the framing that I came to really understand the LEAD CARPENTER SYSTEM. Basically he is on your site EVERDAY.... how many people go through a one year Reno and say someone was onsite every single day? He is not just responsible for framing and other carpentry work but management of all other trades ensuring the utmost quality. I remember Brendan telling me early on Blair would be the guy he would have build his house. I understand why!! His attention to detail and passion for what he does shows through every part of my home and even though our constant changes must have driven him mad we love the house he built for us. When I think of the money he saved us by pointing out or recommending changes before it was too late and would have been extra cost my head spins. People ask us what would you change or do different and I think it's a large part thanks to Blair there really isn't much. This team gave my wife and I, and our newborn son our absolute dream home. Every homeowner needs to go into reno's with eyes wide open. It's stressful, prepare for and expect the unexpected, but when you have people who stand behind there product no matter what, that's what your hiring in Eurodale. 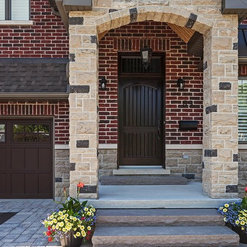 We had our extensive home renovations done with Eurodale. 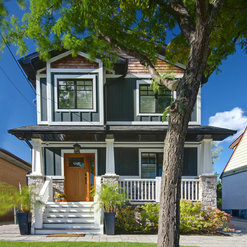 Our home was a challenge is it is a heritage home with wonderful old elements, and we like a more modern style. How to combine the two dichotomies? Eurodale worked really well with our ideas. Although there were some unexpected delays, Jim, Brendan, Scott, Blair and the rest of the team were respectful, and engaged during the process. They are a very knowledgable and talented bunch! We love our new space - I would highly recommend this group. Wow - thanks for the nod Lopita! Receiving notice of this review was a fantastic surprise. It was a pleasure to build for you and your family, and we are all very proud of the project and how it turned out. Happy Holidays! Eurodale is an award winning builder, it always strives to create a showpiece for both form and function with each and every renovation. They treat every project as a new chance to prove their award winning skills, and to add another fully satisfied client to the long list. Eurodale is a pleasure to work with. From the start of each project , they will become your resource to planing, coordination, management, and impeccable realization of the final product. Eurodale Developments Inc answered a question: where is the pivot mirror from ? 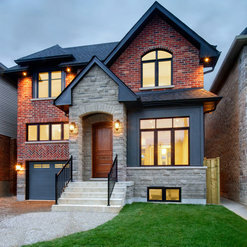 Eurodale Developments Inc answered a question: What is the wall color? 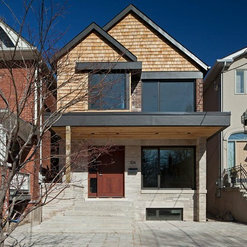 Commented: Where is the frameless glass tub enclosure from?Our local Toronto custom glass trade. I am sure there are some local to your area! Thanks for the interest in Eurodale. Commented: I’d also like to know the paint color?Thanks for your interest in Eurodale. Unfortunately we do not keep those records easily accessible for that long - this project is 10yrs old! Commented: where is the pivot mirror from ?Thanks for your interest in Eurodale. It’s from Gingers, a local Toronto fixture supplier. Commented: The paint on the wall is beautiful and would like to know the color. PSorry we do not retain the information for this long. The project is 10yrs old! Thanks for your interest in Eurodale! Commented: What is the paint color of the vanity, please?Thanks for your interest in Eurodale! Off memory I believe it’s Kendall Charcoal.